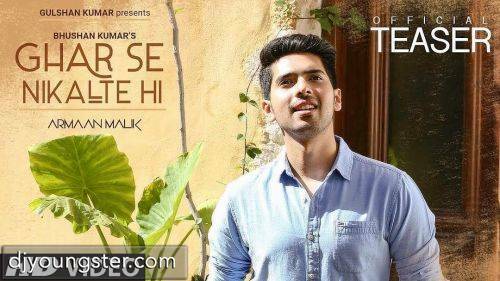 Ghar Se Nikalte Hi full song: Armaan Malik’s and amaal mallik soothing vocals capture the essence of innocent romance Armaan Malik has crooned the song that was originally sung by Udit Narayan in 1996 for the film, Papa Kehte Hain. Ghar Se Nikalte Hi full song: Every romantic 90’s kid and kove birds will agree that the song from papa kehte hai Ghar Se Nikalte Hi captures the emotions of a whole generation. In an era, where technology like whatapp, facebook ,twitter and instagram not theire technology had very limited role to play, lovers had to make do with that one loving look, which they did get after hours of waiting. The original song from papa kehte hai , Ghar Se Nikalte Hi song was romance at its purest best Continuing the new trend of rehashing their own hit songs from year, T Series launched a new version of Ghar Se Nikalte Hi song on Wednesday. Singer Armaan Malik has crooned the song that was originally sung by Udit Narayan in 1996 for the film, Papa Kehte Hain song ghar se nikalte hi originally featured in the Jugal Hansraj and Mayuri Kango-starrer, ‘Papa Kehte Hain’ (1996) . The new song ghar se nikalte hi has been composed by music director Amaal Malik while Kunaal Vermaa has penned the lyrics Ghar Se Nikalte Hi song, the new song has been filmed in the gorgeous locations of Chania, which is in Crete. The city has a gorgeous waterfront, which has been captured beautifully in the song Amaal shared the video and tweeted, “bit.ly/GharSeNikalteHi #GharSeNikalteHi Our tribute to #RajeshRoshan @Javedakhtarjadu #UditNarayan Directed By : @charitdesai Lyrics : @kunaalvermaa77 Singer : @ArmaanMalik22 Music : @AmaalMallik Label : @TSeries. T-Series in 2018. The full video song ghar se nikalte hi song will also feature debutant Angel. The music has been recreated by Armaan’s elder brother, composer Amaal Mallik, with additional lyrics by Kunaal Vermaa.